$29.95 In stock. Order in the next 12 hours, 7 minutes and it will go out today! Screaming with delight! That’s what your kids audience will be doing when you learn this classic trick with an ungimmicked cloth handkerchief. With a few simple folds of the hanky, you turn it into a mustache, an iron, an earring, a candy wrapper, and finally an animated little mouse. When you wind him up with an invisible magic key, suddenly his tail begins to move; he crawls up and down your arm; then leaps uncontrollably into your audience! It’s a guaranteed screamer and oh so much fun for you, the children and adults watching the animated nonsense. How does it work? Don’t worry. There are no strings, motors, magnets, wires or gimmicks of any kind. It’s easily accomplished through some unseen manipulation that is actually quite easy to learn. The result? You master a delightful five-minute routine that can be carried in your pocket ready to be performed close up, at a kid’s birthday party, a school, library or even on stage! For years, Quentin Reynolds specialized in children's shows. 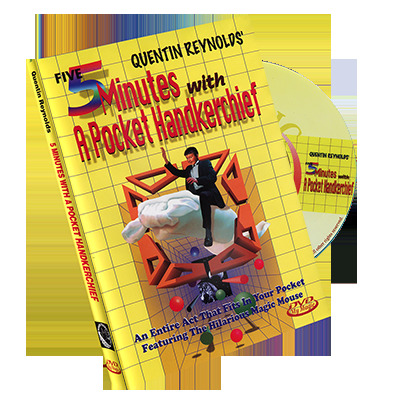 On this DVD, you are first treated to his live performance in front of a classroom filled with children where Quentin brings the kids to a frenzy using this handkerchief routine and the many gags and touches which make it a masterpiece. Following the performance he shares everything you need to know to perform the act. Watch the video. The routine is a brisk, upbeat sequence of effects that begins with stretching the handkerchief and culminates with the animation of the Magic Mouse. The Magic Mouse: The handkerchief is folded into a hat, an iron, an earring, a mustache, and finally into a mouse. The mouse is wound up and begins to wiggle its tail. It comes to life as it runs up and down your arm, around your neck, and then leaps into the audience - making them squeal and giggle. When the mouse's tail is pulled, it turns back into a handkerchief which is folded and put back in your pocket – and presto, you’re completely reset. .
You are also taught Frank Garcia's Iron Gag, Stewart Judah's Watchwinder Gag, tips from George Sands, Harry Blackstone, Sr., Dan Garrett, Martin Gardner, and tons of jokes, gags, by-play, tidbits, and advice which can only be learned from years of continuous performance that Quentin Reynolds has experienced. Watch the video and you’ll see it all come to life at a live kids show. At AmazeKids we recommend you purchase the classic “WatchWinder” gimmick to create the sound of winding up the animated mouse. Search for Arm Ratchet Gimmick or click on the recommended product below. Get Five Minutes with a Pocket Handkerchief and add a sure-fire routine to your repertoire that will delight the young – and the young-at-heart -- anytime, anywhere you do magic.